Harmonito Dela Torre of the Philippines faces Angel Luna of Dominican Rebpublic for an 8th-round non title fight on October 23, 2015 at Celebrity Theater, Phoenix, Arizona. Dela Torre is 21 year old boxer from Cagayan de Oro City, Misamis Oriental, Philippine. He has record consisting of 16W with 11 coming by way of KO. 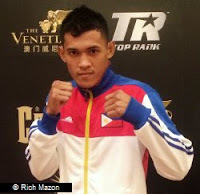 The Filipino fighter is a former World Boxing Federation World super featherweight champion. As of now the young kid from the Philippines will try to maintain his unbeaten record. Dela Torre won his last 6 fights all by way of KO. On the other hand, Angel Luna from Dominican Republic has a record of 11 wins including 6 by way of KO and has only 1 defeats. Luna also known as "El Gato" won his last fights against Jose Lopez of Puerto Rico via 6 round UD.